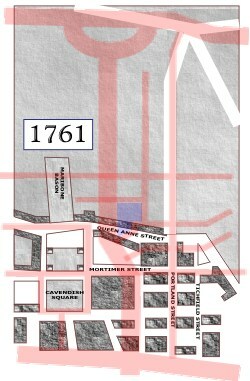 Building in the area quickly accelerated, and by 1755, Queen Anne Street had been built, running roughly east/west across the current site of Broadcasting House. At this time, just a few yards to the west (bordering on the north of Queen Anne Street) was Maribone Bason (the spelling of the time), built as a source of drinking water for the many new houses being built - a place where people swam, and frequently drowned. The 1761 map shows Queen Anne Street as it cuts across the front of where Broadcasting House now stands. As the 18th century drew to a close, Edward Harley's cousin, Lord Foley, took out a lease on a plot just to the north-east of Cavendish Square and running right across Queen Anne Street. He built a large mansion there (Foley House), and its grounds sliced right through the middle of Queen Anne Street. 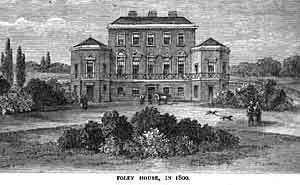 Lord Foley had a magnificent view of Marylebone Park (now Regent's Park) to the north, and using his Parliamentary contacts he had an Act of Parliament passed with the intent of preventing the land-owner, the Duke of Portland, building anything north of his property and so obstructing his view. In the 1770s, architect Robert Adam was starting to lay out plans for what was later described as "one of the architecturally finest streets in London". Portland Place was set to run from the north end of Foley's property all the way up to the Marylebone Park to the north. But Adam was hampered by Foley's Act of Parliament. This Act said that nothing could be built that would block the view from Foley House (shown in the picture below). Adam complied with the letter of the law and made sure nothing was built immediately north of the house. 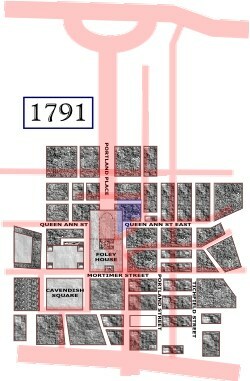 And so he built the street exactly the same width as Foley House, as can be seen in the 1791 map on the left. That is why Portland Place is one of the widest residential streets in London, at 125 feet. The picture to the right shows the frontage of Foley House itself, looking down from the southern end of Portland Place, and in a position just a few feet to the left of where The Langham Hotel was eventually to be built.